German exports reversed a three-month slide to a 1.7% rise in March. Still, German exports are ‘not out of the woods.’ They have fallen month to month is five of the last seven months. The chart shows that exports are having a weak bounce in March compared to their recent downward path. But German imports are not doing much better. Imports fell in March and now are on a three-month losing streak. 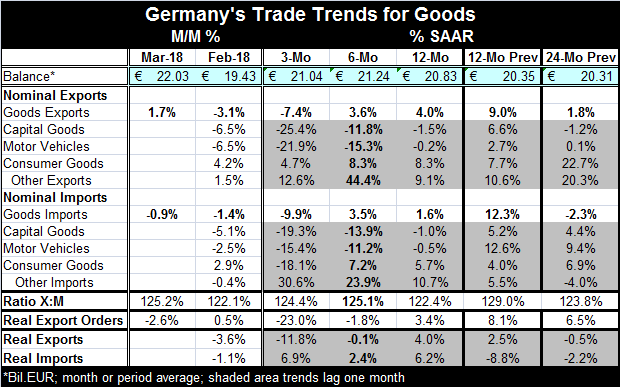 Both German exports and imports show modest growth over 12 months and six months with sharp declines over the most recent three-month period. Capitals goods and motor vehicle exports and imports both are showing sharp deterioration over three months on both the export and import side of the ledger. German exports show a more or less steady expansion for consumer goods while for German imports on consumer goods are off sharply over three months but growth at nearly the same pace as exports over six months and 12 months. The ratio of exports to import had eroded then stabilized over the past year but with the new March export revival the ratio is back above its level of three years ago. Real export orders fell in March and are falling at an elevated 23% annual rate over three months. But over 12 months, German real orders are rising by 3.4%, more or less in line with the 4% growth rate for German real exports. German inflation adjusted trade flows are only up-to-date as of February. As of February, both real exports and imports were falling. However, real exports also have negative growth rates over three months and six months. German real imports show increases over three months, six months and 12 months. On balance, German trade flows do not show a lot of life. Real export orders are lethargic too. The Markit PMI indexes have been signaling some slowing for Germany - as well as more broadly. Today’s IP report for the German economy shows growth advancing with IP up by 1% in March after a 1.7% drop in February and a meager 0.1% gain in January. Slowdown has been written all over a number of German reports recently. And with the first quarter data completed, German IP was dead flat in Q1 with manufacturing production up at only a 0.5% annual rate. The German economy still seems to be caught in a soft spot. While exports and IP have reversed drops from the previous month, there is no vigor in the German reports. The evolving international scene The international story seems to be shifting with more trouble emerging. Argentina’s 40% interest rates are an eye opener. In Europe, Italy maybe set to rerun its elections because it cannot form a government. The Five Star Party is thinking of having a referendum on EU membership at some point if it can gain enough influence. Europeans greatly resent the U.K. having let its people have a referendum on the EU that led to their rejection of it. But elsewhere in Europe, most countries remain run by elites who do not want to give the people a chance to register their vote. I suspect that the Europeans’ ill feelings toward the U.K. are less for leaving than for letting their own people vote on the idea. Italy is under a great deal of pressure as it is being flooded by migrants and being given very little assistance by the rest of the EU to deal with the problem. On top of that, the Italian economy remains below the level of real GDP it had attained at the time of the financial crisis in late-2017. Italian banks are in need of attention. Italian GDP has evolved very slowly as EU debt rules have restrained any stimulative policy response. The country it is being flooded by migrants that EU rules will not allow them to deflect. Italy faces problems. The EU offers impediments. In Italy, something has to give. International growth is no longer the evolving bright spot many thought it would be as 2017 drew to a close. Despite some upbeat IMF assessments, it looks like problems have lingered and now are spreading. There is nothing like a reversal of easy money policies to bring out unpleasant surprises in developing economies. Since the Fed seems unwilling to put much weight on the damped global inflation environment when setting its policy, maybe that very environment will have to communicate with the Fed in another way to stop the nonsense of its expected path of rate hikes. I have been worried about the repercussions from all this easy central bank policy reversing at the same time. And while not all central bankers are taking decisive steps now, there is a lot of momentum that has switched to looking for that either to happen or to continue happening as in the case of the U.S. and the U.K. While central bankers have worried about creating a bubble with their easy policies, it may be the unwinding of these policies that does more damage because clearly the global economy is not ready for policy normalization yet. Moreover, no one even knows where normal is or what it looks like. Maybe central banks should put out an APB?